And immediately he left the synagogue, and entered the house of Simon and Andrew, with James and John. Now Simon’s mother-in-law lay sick with a fever, and immediately they told him of her.And he came and took her by the hand and lifted her up, and the fever left her; and she served them. That evening, at sundown, they brought to him all who were sick or possessed with demons. And the whole city was gathered together about the door. And he healed many who were sick with various diseases, and cast out many demons; and he would not permit the demons to speak, because they knew him. 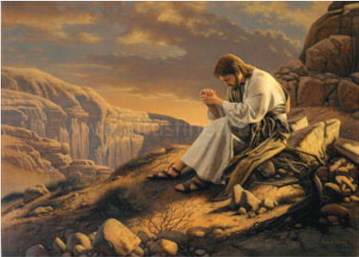 And in the morning, a great while before day, he rose and went out to a lonely place, and there he prayed. And Simon and those who were with him pursued him, and they found him and said to him, “Every one is searching for you.”And he said to them, “Let us go on to the next towns, that I may preach there also; for that is why I came out.” And he went throughout all Galilee, preaching in their synagogues and casting out demons. This is a very important part of the life of a priest, in fact you could probably say that it is the most important part. If a priest doesn’t pray, then how does he expect his spiritual children to pray? If a priest doesn’t pray how does he find strength to keep up with his hectic schedule? If a priest doesn’t pray, lots can happen. and lots can go wrong. Christ, through going out and praying, through taking time out of his very busy schedule to receive strength, to receive the will of his Father, to develop his relationship with his father, was able to die on a Cross all while carrying the weight of the world’s sin on his shoulders. If Christ didn’t pray what would have happened? If a Priest doesn’t pray what would happen? If the people don’t pray, what difference will it make in their life? If the people don’t pray for their priests to remain strong and carry-on, what happens? Prayer is the most important part of our relationship with God it would seem to me. Because of prayer we are able to have that direct link and bond with Christ. Both communal prayer, and also private prayer is strongly encouraged in the Seminary. Without it, we would not be able to discern truthfully what our vocation in life is. Prayer is an integral part of Christ’s life, the priest’s life, the religious’ life, a seminarian’s life. Shouldn’t it be an integral part of yours too? Pray for Vocations to the Religious Life and the Priesthood. Without them, who will encourage us to pray?